Now the center of the traffic circle. Hasbrouck and Continental are straight ahead. Looking toward, what is now, GHS Jewelers on the left and The Trestle in the center with awnings. 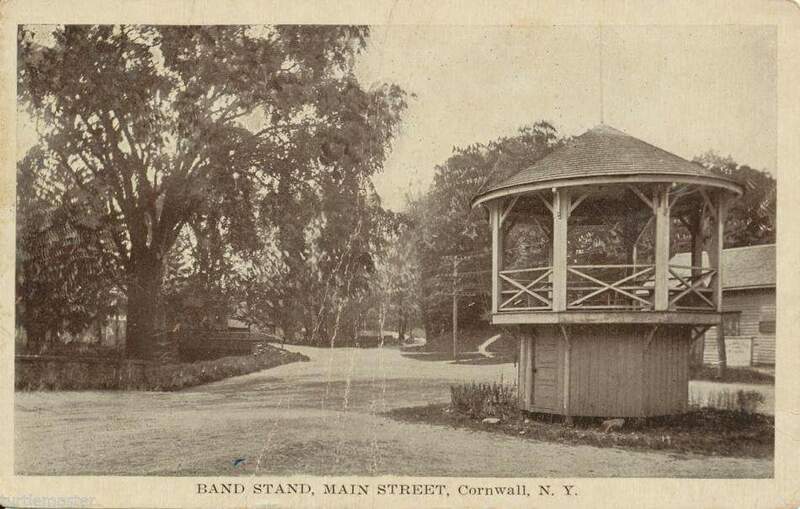 Cornwall, Town (pop. 12,307, 2000 census) located in Orange County in the mid-Hudson region, was founded in 1788 and settled by families of British descent, many of them Quakers. An early 19th century post for shipment of county agricultural products, it was popularized in mid-century by resident writer Nathaniel P. Willis for its Hudson Highlands scenery, healthful climate and easy access via river steamers. The town's largest industry was the Firth Carpet Company (1886-1962). Now a residential community, its farms and estates have been converted into housing developments. Tourist sites are the Storm King Art Center, a famous outdoor sculpture park; the 1760's Sands-Ring House, residence of a Quaker family; and Kenridge Farm, a nature museum. Cornwall, Village (pop. 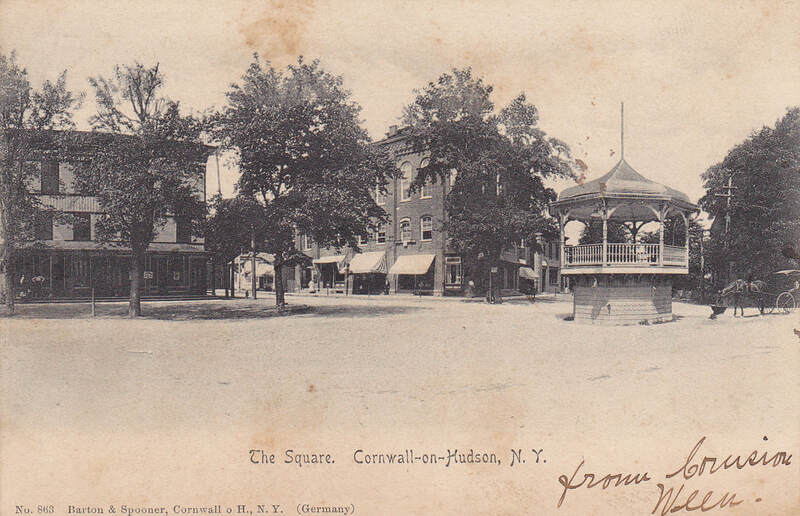 3,058, 2000census), incorporated in 1884, is a section of the town bordering the Hudson River; the name was changed to Cornwall on Hudson. The first mayor, Thomas Taft, organized electrical and telephone companies in the 1890's; he also headed Mead and Taft Company which built homes and public buildings, several for summer residents whose estates lined the bluffs above the riverside railroad yards and docks, also on mountain heights. Some of these famillies contributed to the community: the Matthiessens, a library, the Stillmans, a printing press and hospital. The proposed Con Ed Hydroelectric plant at Storm King Mountain stirred up a 17-year controversy until abandoned in 1980, leaving the village with a fine riverfront park. Mountainville is a hamlet in the western section of the town of Cornwall. It is a mostly wooded, lightly populated area, located in the narrow valley of Woodbury and Moodna creeks between Schunemunk Mountain and the Hudson Highlands. The New York State Thruway and NY Route 32 run through the hamlet. The population there is centered in the area around Taylor Road between 32 and the Thruway. Storm King Art Center is located in Mountainville. Winslow Homer, the famous water color artist, spent summers in Mountainville as a young artist and many of his pastoral themed water colors were made there and depict the local scenery. It was originally called Ketcham Town in honor of Samuel Ketcham an agricultural pioneer who established a grist mill on the creek. Some of his descendents still live here. 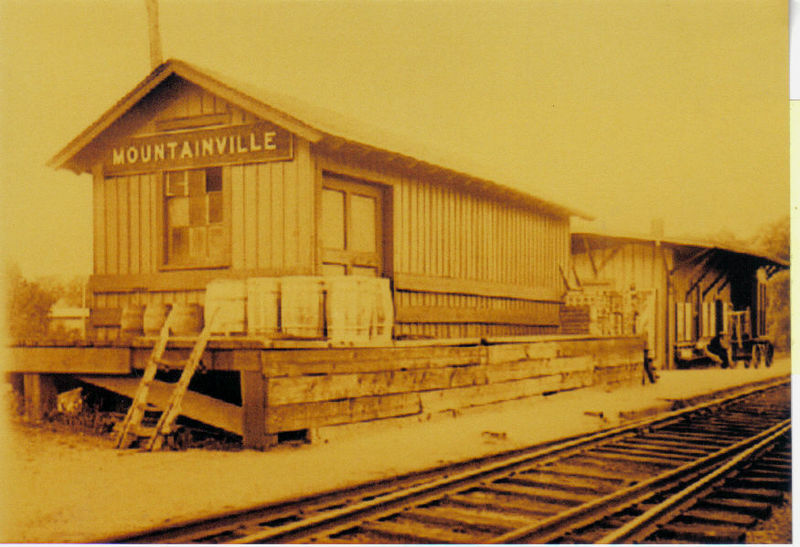 Around 1850 the name was changed to Mountainville when the Erie short cut railroad came through. 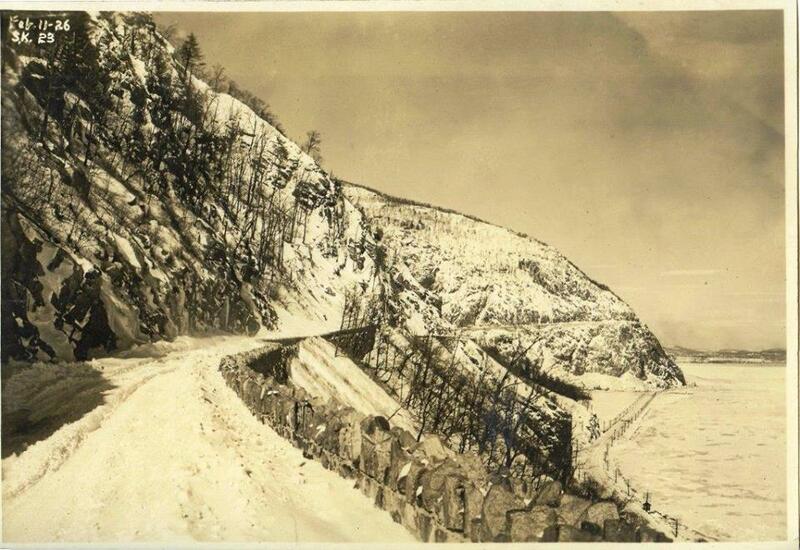 Route 218 Storm King Mountain heading North to Cornwall 1926.